I love Lake Winnipesaukee for its beauty and sereneness. Whether you're riding in a boat or sitting on the shore, Lake Winnipesaukee just emanates freeness. It's almost like a rebirth after a long winter. When I'm on the lake, I seem to lose my stiff, uptightness that I gain over the winter. 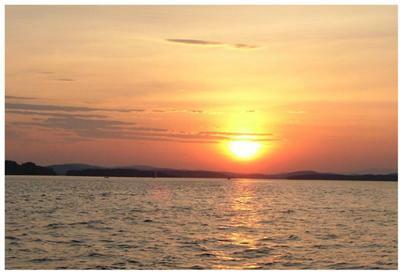 Lake Winnipesaukee is the perfect place to take sunset cruises. Most of the other boats have already gone in for the day so it's quiet and more relaxing. In the fall, the leaves are turning and the whole lake seems to glow. Nature shows in all its glory. Many of the feelings I get are indescribable, but I just love Lake Winnipesaukee. Join in and write your own page! It's easy to do. How? Simply click here to return to What I Love Most About Lake Winnipesaukee.